With their exquisite detail and bright colors, cloisonne jewelry pieces are miniscule works of art. For centuries, jewelers have used this ancient process of applying colored enamel to metal in order to create spectacular bracelets, pendants, earrings, and more. Today, this type of jewelry enjoys enduring popularity. Cloisonne jewelry is colorful and intricately detailed. In this amazing work, small metal filaments separate different colors of enamel. Patterns range from simple flowers or vines to animals, trees, elaborate scenes, and much more. You'll find this amazing technique on everything from bangle bracelets to individual beads. According to Fire Mountain Gems, the cloisonne technique may date back to 1800 BC. Originally, the process involved fusing gems to metal, but this quickly transitioned to melting brightly colored glass powder or enamel onto the metal surface. The name "cloisonne" comes from the French word for "partition." Like tiny stained glass windows, the various colors of enamel are separated by bits of metal. In order to create these separate compartments, jewelers use a technique that is similar to filigree. They solder tiny wires to the base piece to create the individual sections. The artist then fills the sections with the enamel powder or paste and fires the piece at a high heat to melt the enamel. Many pieces require the artist to use multiple layers of enamel, firing each layer at a lower temperature after it is applied. Polishing and metal plating complete the work. Although this ancient art has been around for centuries, it has really only been popular among American enthusiasts for the last century and a half. According to Lang Antiques, Western consumers became enamored with this technique in the mid-1800s. From that time on, artists and jewelry manufacturers have used this technique to create gorgeous baubles. Beads - Whether available for purchase individually or strung as a necklace or bracelet, cloisonne beads offer a lovely, three-dimensional way to appreciate this art. Pendants and pins - Because of the intricacy of cloisonne work, this art is perfect for the focal point of a necklace or as a pin. Cloisonne pins pendants range from tiny, understated elements to large statement pieces. Bangle and cuff bracelets - Although you can purchase beaded cloisonne bracelets, there are also many bangle and cuff designs that use this technique too. Because the surface area is larger, long, scrolling patterns are common. Rings - Cloisonne rings can include enamel that goes all the way around the band, or they can feature an enameled focal point set on a metal ring shank. 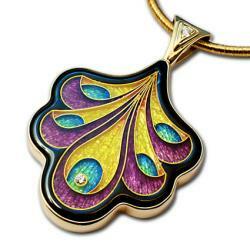 Some designs also mix cloisonne enamel with traditionally set gemstones. Earrings - Earrings can show off a cloisonne dangle or be a simple post style. Either way, they offer a fun pop of color and delicate workmanship. Michael Romanik - This renowned cloisonne artist creates beautiful modern pieces inspired by nature. His brooches, pendants, earrings, and bracelets feature bright colors and images of birds, flowers, and leaves. Falcher Fusager - This artist and owner of MAGICK jewelry specializes in modern cloisonne designs set in gold and sterling silver. The pieces feature geometric motifs, spirals, and integrated gemstones. Joan Strott Alvini - Although this artist does not limit herself to the cloisonne process in her enamel work, she does produce many pieces that use the technique. 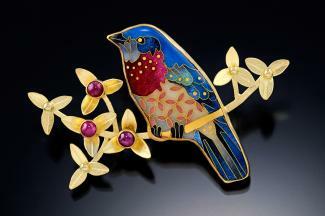 You'll see cloisonne enameled earrings, rings, and pendants in her gallery. The surface of the piece should feel smooth. There shouldn't be any rough edges to the wires. Each section should be filled with enamel. You should not see sections that are lower or higher than others. If it is crafted from precious metal, the jewelry should be marked with the metal content. Cloisonne looks spectacular against black, since the plain, dark background allows the details and metal to shine. Contrast your clothing with your jewelry by wearing a simple turtleneck or a basic dress with your cloisonne pieces. This allows your jewelry to take center stage. Consider pairing a statement-making cloisonne bangle or necklace with simpler chains or plain bracelets. Set against the layers of simple metal, the cloisonne will stand out beautifully. Be careful not to overpower cloisonne pieces with busy patterns, lots of other accessories, or tons of color. Use a very soft, lint-free cloth and plain water to clean and polish your cloisonne enameled pieces. If you have an antique piece of cloisonne that has cracked enamel, you'll need to have it professionally repaired. Work with a restorer that specializes in this process. 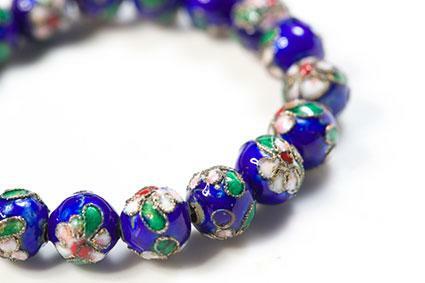 Do not use any type of chemical or abrasive cleaner on cloisonne jewelry. The chemicals and abrasives can etch the glass. Do not soak cloisonne jewelry since small voids in the enamel might absorb liquid and eventually sustain damage. Similarly, do not use an ultrasonic jewelry cleaner on your cloisonne pieces. Store cloisonne items in separate compartments or jewelry bags to keep the delicate surface of the enamel from getting scratched by your other jewelry. When traveling, store your items in a jewelry roll or travel organizer. With its intricate, multi-colored enamel and shining metalwork, cloisonne jewelry captures the imagination. Understanding the process of making this type of jewelry can add to your enjoyment of your favorite pieces, and knowing how to select and care for cloisonne can help you ensure those pieces last a lifetime.